Sri Ramanujamji, a senior disciple of His Holiness Maharanyam Sri Sri Muralidhara Swamiji, captured the hearts of Austin residents with 3 discourses at two different temples on the opening weekend of the New Year 2010. 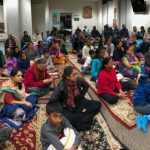 Austin Hindu Temple hosted a two-part lecture by him on the ‘Essence of Srimad Bhagavatam’ on Saturday and Sunday, Jan 2-3, and on Saturday evening, the Shirdi Sai Baba Temple of Austin hosted his talk on ‘Sri Hanumanji Prabhavam’. 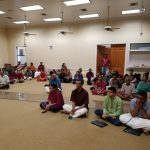 In the divine ambience of Austin Hindu Temple, Sri Ramanujamji spoke with great clarity and broke down the seemingly complex Sanatana Dharma into easily understandable everyday language. Srimad Bhagavatam, the crown jewel of the Puranas, is the essence of all the scriptures. 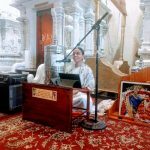 Its crux is that Nama Sankirtan (singing the Names/glories of the Lord) is the easiest and surest way to obliterate all our sins and take us to the holy feet of God. In his own inimitable style, Sri Ramanujamji mixed in several contemporary stories and common everyday examples to highlight the glory of this ancient scripture. 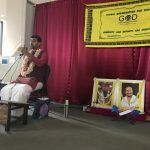 At the Shirdi Sai Baba temple, he spoke on Hanumanji, quoting elaborately from Srimad Ramayana to highlight the tattva (philosophy) behind Hanumanji, which is nothing but the greatness and significance of a Guru. Sri Ramanujamji captured the rapt attention of the listeners in the 2 hour discourse where everyone enjoyed the different ways in which he elucidated Hanumanji’s glory. 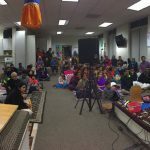 On Sunday, Jan 3, Sri Ramanujamji also conducted a 30 minute kids’ program at the Austin Hindu Temple where more than 20 children joined him on the stage to sing the divine Hare Rama Mahamantra and listen to an episode from Sant Eknathji Maharaj’s life that illustrated the virtue of calmness and poise. Later the children were quizzed on the glorious heritage of Sanatana Dharma. All the children were excited to participate and took home a great message that by merely chanting the Names of God, one can achieve anything in the world.